The present monograph deals with the issue of language use among bilingual Mongols – i.e. who speak Mongolian and Chinese – in the Inner Mongolia Autonomous Region of the People's Republic of China and ex­plores the significance of language with regard to their identity. The relationship between language and identity and the relevance of language for identity construction are interpreted differently both with­in this group of speakers and among the Mongols of the Republic of Mongolia who were consulted within the framework of this research. Cross-cutting ties that base upon group-specific characteristics such as language use are decisive for these interpretations. By means of strategies of inclusion or exclusion these characteristics may be ignored, reinterpreted or emphasized to support the respective identity construction. The present book describes and explains these differences of interpretation. The bilingual Mongols mix Mongolian and Chinese in their speech, thereby creating peculiar neologisms referred to as sinisms by the author. 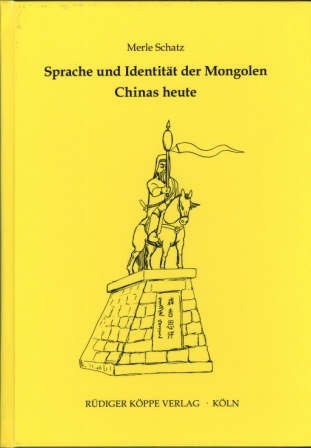 Mongolian-Chinese language contact phenomena have already become manifest in the literary genre of bensen üliger (booklet stories) of Mongolian orature. Bensen üliger are modern Spielmannsdichtungen of Inner Mongolia that are passed on orally but originally emanate from written templates. The first chapter deals with the conceptual delimitation as well as the demographic and geographic descrip­tion of Inner Mongolia and elaborates on the language use in this area. The second chapter describes the genre of bensen üliger, its emergence and expansion, forms of recitation, as well as the Chinese templates and expressions. The third chapter discusses the distinction between Hàn and non-Hàn from a historical perspective to provide explanations for today's unequal treatment of the respective groups and their lan­guages by the Chinese state. Chapter four sheds light on the language contact situation in Inner Mongolia; it de­scribes and analyses code-switching between Mongolian and Chinese, transfer phenomena concerning lexis, phonology, morphology and syntax and goes into detail regarding the neologisms/sinisms. The fifth chapter is concerned with the connection between language use and identity and reveals the dilemma the Mongols of Inner Mongolia find themselves in: Being part of the Chinese state, they have to conform to its social order and language policy, but at the same time they seek to preserve their Mongolian identity, not least to defend themselves against reproaches by the Mongols from the Republic of Mongolia who suspect them of having become Chinese. Only by changing allegiance, i.e. by taking the Chinese or Mongolian position according to the respective context they succeed in consistently reconstructing and justifying a Mongolian identity.